The crux of knowing what take is knowing what to expect. This list is for our normal high altitude Nepal treks, see our lodge trek gear discussion for teahouse trekking. Do have a look over what people are wearing in the photos of each trip too, that is a great indication of conditions and what is suitable. You will feel your best with plenty of good food and by keeping hydrated. On our camping treks we provide good, nutritious food (plenty, all you can eat!) and clean water too. However, inevitably you want some snacks for that 10am stop and midnight munchies. Since we are exercising hard, it is particularly worth focusing on healthy, nutritious snacks. We recommend quality energy bars from home such as Clif Bars/Power Bars or your other favourite, although there are some Indian-made bars that are OK in Thamel. Ready-made healthy trail mixes are readily available, and can be post-mixed with cashews and others, but don't forget some ziplocks. Longer term energy (low glycemic) is best however, sometimes, a sugar hit is needed to fuel that addiction, and there are plenty of chocolate bars available in Kathmandu or sometimes along the trail, to save your luggage allowance. If there is a low country sweat, we usually carry Tang (which is mostly sugar) and medical electrolytes however if you regularly use sports energy drink or electrolytes, bring your favourite. We also suggest fizzy multi-vitamins. In normal life, supplements are not necessarily recommended, however we are pushing our bodies hard and occasional multi-vitamins do mean less sickness and better recovery. We cook a wide array of meals but occasional 'surprise' snacks to share with the group provide a welcome variety during the trek. Lastly, after plenty of reading, I realize that while trekking you can never eat enough protein. You need more than a normal diet (any diet!) can provide, and so I strongly suggest bringing along some protein bars, one for every second day or so, or buy them in Kathmandu. From April to the end of October (ie summer), it is warm, even hot during the day. Cool, light clothes are best. In winter, November thru to the end of March, it is still usually warm during the day and a single layer will often do, but pants rather than shorts, however in the evenings you will want a jacket, and during late December thru to February, a light down jacket is better for eating/drinking outside. The hotel stores luggage free of cost whatever you don't take trekking, and of course they have a laundry service. You might want to plan a clean set of clothes for your return from the trek. You carry a day pack with your camera, jacket, small personal med kit, water and snacks. The porters (or sometimes yaks/mules) carry everything else, and you pack this in a duffel/kitbag rather than backpack. Obviously, much of your gear will fulfill multiple roles. For Kanchenjunga, Manaslu and Annapurna treks it really can be hot and sweaty in the initial low country. For spring (April-May) you might also want an umbrella (available in Kathmandu), better in rain than any waterproof jacket. Especially for Oct-Nov-Dec treks you really do want WARM gear for the evenings, a good down jacket and some insulated pants, and a real 4/5 season -29C/-20F sleeping bag. LeeAnn with cotton scarf: ultra-light anorak over a thermal top and fleece, softshell pants, tough but light hiking boots and attitude! Virtually all trekking gear is available in Kathmandu and we are happy to show you the better shops. Tridevi Marg is a street with mostly top notch imported gear, Mountain Hardwear, The North Face, Outdoor Research, Marmot, Black Diamond climbing gear plus head torches and others, and prices are reasonable, roughly equivalent to the no tax USA prices. Locally made gear is much cheaper and must be tried on carefully and checked carefully for quality, but on the whole it is OK.
You can by the majority of your gear in Kathmandu but do allow time for this. For all the treks your gear that is carried by the porters or yaks is best packed in a strong kitbag. A simple design without wheels or frame. You can buy cheapie kitbags in Kathmandu, although they are not as tough as say the popular North Face Base Camp Duffel. Mountain Hardwear duffels look tough but are not. My favorite is the Patagonia Black Hole duffel, 120L (or 90L if you are a compact packer). You also want a bin liner to provide total waterproofing. Down-filled bags are better for Nepal and beg, borrow or steal a good one. High country 5000m nights are cold and you need a 4-5 season sleeping bag, so a bag rated better than -24C/-10F and for high altitude late October or November nights a rating closer to -29C/-20F is best (the extreme rating, NOT the comfort rating). Note often your bag will get slightly damp and you might not have a chance to dry for several days (down is still better), and in the lower oxygen environment, you feel the cold more easily. That is why you want an overkill bag. Good down is fluffy, light and thick, 700 to 800 fill is the best. A muff (an extra section around the neck) makes a big difference to the overall warmth of a bag. Reasonable sleeping bags are cheaply available for rent in Kathmandu. Alternatively add a fleece sleeping bag liner to add warmth to a 3-4 season bag. See REI's advice page for a good intro into the technical aspects of sleeping bags. Cotton, silk, thermal or fleece. Saves washing your sleeping bag and adds warmth. Available in Kathmandu. For camping trips, we provide a closed cell mattress as standard and bring your own air mattress for the highest level of comfort. If you don't have an air mattress, you can buy in Kathmandu or we can provide a sponge foam mattress, which is ok but not as comfortable as the new generation air mattresses. We are sleeping in cold conditions, bring a winter-rated insulated air mattress. This should be comfortable and a good waist band that transfers some of the weight to the hips is most important. It needs to be big enough to take a jacket, fleece, water, camera and odds and ends. Some trekkers get away with a 25 litre pack, however 35-45 litres is the sweet spot if you are not such a careful packer. The Black Diamond range and others are readily available in Kathmandu. For a happy trek you need comfortable feet. Good boots have good ankle support, plenty of toe room for long descents, a slightly stiff sole to lessen twisting torsion, and are light because with every step you lift your boot up. Good hiking shoes or strong, durable trail running shoes are also OK, if they are your norm. Gore-tex boots have an inner liner that help with warmth but your feet tend to sweat more in the warmer low country. You don't necessarily need Gore-tex boots. Good lightweight trekking boots or light all leather boots are perfect. Boots must be lightly worn in before trekking and this should include some steep hills to show up trouble spots. The rougher the trek, the longer the trek, the tougher and newer your boots should be. If you are trekking in heavier boots then it may also be worth taking along some light trail running shoes (eg Salomon XA's), and wear these for the first few days, switching to real boots in the higher country or when it rains. My absolute favorite boots are the La Sportiva's Trango TRK GTX which are lighter and more flexible than a web picture might show, and available in Kathmandu. Also check Scarpa's range as another starting point. In the low country your feet will be warm or even hot while walking so quality cotton mix sports socks can work well, or light hiking socks. Three to four pairs are enough. Thick trekking socks are better for higher up and cool evenings, another three-four pairs. Modern trekking boots fit snugly so wearing two pairs of socks at the same time is impractical. Socks with a high natural fibre content, either wool or cotton, are usually more comfortable and less smelly than highly synthenic socks. I find a cotton-Coolmax blend works well, and straight cotton. Luxury and convenience for your feet at the end of the day. Crocs are the best all round, being so light, and combine with socks once high up. Or to back boots up on remote treks consider cross-trainers/trail running shoes which double as spare trek shoes. For teahouse treks where you can shower regularly flip-flops or crocs are essential, and cheaply available in Kathmandu. Most trekkers consider this essential for the daypack but alternatives are a thick thermal top or a light down jacket. Essential for the cool evenings. If you don't already have a jacket, they are readily available or easily rented in Kathmandu for around $1 a day. A down jacket is the best option, although Primaloft is OK for less cold treks. Waterproof and breathable. Gore-tex or similar jackets are recommended for treks over passes or climbing trips. Plastic ponchos or non-breathable raincoats are not suitable. Good thermals, both tops and bottoms, are one of the secrets to cold weather trekking comfort. A mid-weight top (zip-T style) is great for high country day wear. Lighter thermal tops, eg merino wool tops, are still useful in the low country and an expedition-weight thermal top is a good warm but light system for the real cold. A mid weight is perfect. A toasty sleep is essential for a full recovery. Great for the chilly evenings, thicker is better (except for when the stoves in the teahouses really heat up!). Readily available in Kathmandu. Primaloft pants are the camping trekker's best friend though. T-shirts are the standby, or sun shirt-style with long sleeves, and made of technical synthetics, light merino wool or the less versatile cotton. A travel shirt is looser than a t-shirt and therefore harder to layer however the collar protects the back of your neck and the sleeves can be rolled up or down. Bring at least two so you can swap damp for dry. You will live in these. Light material, loose and medium-coloured is best. You can survive with only one pair, although two is better, and if heading high, a slightly thicker soft shell pair is really useful. If you have softshell trekking pants then special wind pants are not needed. If you do bring a pair, it is not necessary to have Gore-tex and non-waterproof is quite OK as you won't wear often. Essential for the evenings, and useful for cold trekking days. A basic buff is versatile however for winter trekking consider a combined fleece buff is good or a fleece neck gaiter. A good range for organizing, and preferably light but waterproof. Definitely useful, especially on steep, rough terrain, and we do recommend bringing however, if you are not used to using them, you can survive without. One pole is useful for easing long descents. Bring good wraparound glasses suitable for snow, its bright up there, but specialized glacier glasses with side pieces are not needed. Contact lens wearers report very few problems except cleaning them in the conditions. Ski goggles are unnecessary. A good pair of wind-proof gloves is essential. Available in Kathmandu, both budget and originals. This should be one liter or more in capacity, take boiling water and be leak-proof. Wide mouth Nalgene bottles are best however European-style aluminum bottles are adequate, all available in Kathmandu. You need a minimum of 2 water bottles, or at least 1 water bottle IN ADDITION to a Camelback or hydration system. Hydration systems are loved my many people however are more hassle to deal with in a trekking environment, and you have to be a careful expert to get through a long trek without an accident, and so we suggest against. Very useful on cold high country nights! You can buy a cheap one in Kathmandu. The Black Diamond LED headtorches seem to be better than Petzls. The whole range is available in Kathmandu. Useful; Black Diamond now make a series of small lanterns that hang in a tent. Bring only a small one trekking, a camp towel or simply a facecloth. Tthe hotel supplies towels in Kathmandu. At altitude the sun is strong, especially after snow. Bring sunscreen (high factor protection) AND lip balm WITH SPF 15, and better still SPF 30+. A technical running cap is ideal. A wide-brim sun hat is also good, giving added neck protection. We carry a comprehensive med kit with Paracetamol, Ibuprofen, decongestants, lozenges, various antibiotics for Nepalese varieties of diarrhoea and chests infections, Diamox (an acclimatizing aid drug), antiseptic, antihistamine cream, oral rehydration, splints, bandages and band-aids. You should bring any personal medicines that you need, and if you have had blisters in the past, a good blister kit. On camping treks we provide filtered water morning and evening (or boiled water when particularly cold), and so you can get away without water purification but, especially for a hot trek, it is nice to have more options on the trail during the day. This could be a bottle of iodine tablets or a strip of silver-based tablets, or a Steripen. I have a dated discussion. If bringing only your phone, bring a powerful powerbank. On treks led by Jamie, we do have solar charging. Bring one or two with high swapability. Kathmandu has some great second-hand book shops. Kindles work well for trekking too, and we have a solar recharger. Most people find wearing one while trekking is a hassle and keep it buried in their daypack. The Kathmandu hotel has safety deposit boxes. Not needed but if you have them, consider bringing them if going above 4000m. Not needed for trekking - trekking is walking, not climbing. Fleece lined colourful wool socks are available from some clothing shops in Kathmandu are a great addition to your kit and perhaps more practical than down booties although either will be a luxury for chilly evenings. + a down jacket, medium or thick, available in Kathmandu. Primaloft/fleece and layers isn't good enough. Easy to rent items in Kathmandu are down jackets and sleeping bags. We send our one out on booking. 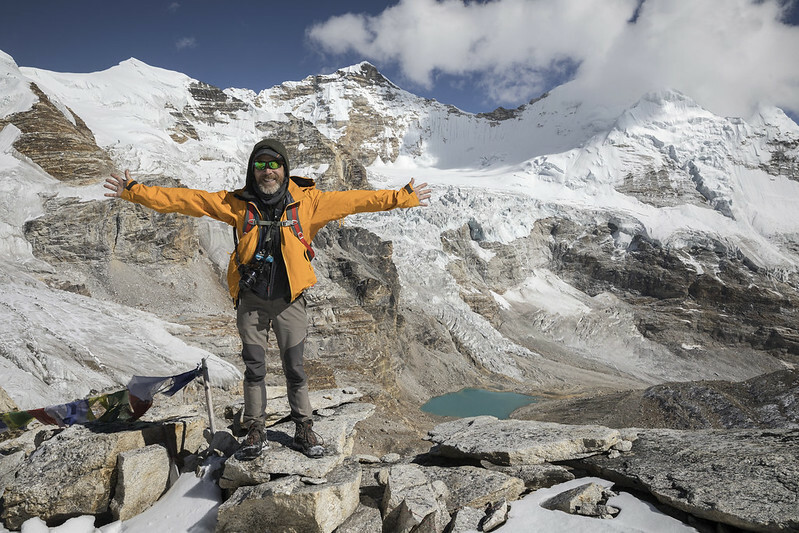 Trekking alone or ultralight in Nepal? Check this double list by Howard and Sue Dengate. For camping trips, we provide all the tents, a closed cell mat, all the cutlery and utensils, cooking pots, stoves; LED dining lights, tables and stools, kitchen tent, dining tent and toilet tent; all the main meals and afternoon tea while trekking but not trail snacks; and the best service we can manage!